Can you believe that I have deadlines, meetings to attend? I’m a business owner; I’m the boss, right? Well, in our little small business world, Jon and I have surrounded ourselves with incredibly smart people who help us continue to keep our Central Florida community fit. So that means I have deadlines and when our Start Line publication is ready to go to the printers, I get to work and start thinking about what you, my customer and reader, might need for encouragement to stay active and healthy. 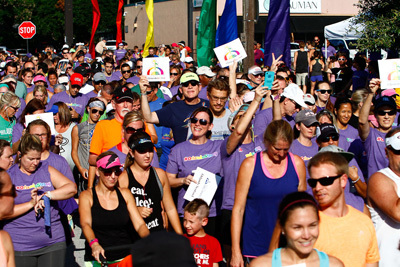 The first two weeks after the tragedy, runners and walkers throughout our community came together for two events that I’m aware of and raised thousands and thousands of dollars for the OneOrlando fund. We came together as a team, created a shirt for donations and expanded our Mid-Week Wednesday run to include over 1000 participants. Together with Paint the Trail artist Jeff Sonksen, we painted and had our own vigil for the Pulse victims as our garage wall became a tribute to honor and remember them all. I met with Eric from Fleet Feet to discuss how Downtown South could promote their businesses after being closed for almost a week. We directed runners to the Final Mile site to register for a fundraising 5k in Lake Mary. This is truly our home, our community, and we will continue to be Orlando Strong! Where do we go from here? That’s easy…we move forward. 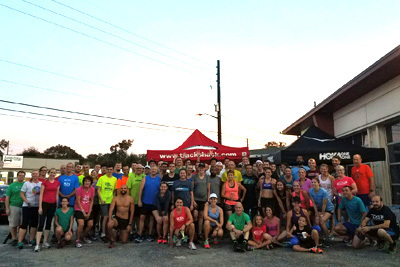 For us, that means we continue to plan for another Track Shack Running Series; the 39th season of the six best events in town! We believe that and we work daily on creating new ideas for all our events. Jon and I absolutely know that our event marketing and management team is the best in the business. We sometimes watch in awe as our creative, energetic staff work behind these scenes to make each event better than the last. We kick off the season on August 13th , (Jon’s lucky number) with the Celebration of Running 5k. I love this run because it is like having a big birthday party for our first born, Track Shack. Don’t worry, Emma, we’ll be making your 30th birthday celebration later this fall just as much fun! Oh my gosh, speaking of fall, just two weeks before Emma turns 30, our son Chris is marrying sweet Allie! What a crazy busy fall we are having this year! This past January, after much contemplation, we re-named and changed our beginning training program. We added coaches and convenient times to our schedule and now include our very beginners through a 10k walk/run. Coach Bob is our leader with a smile. When I introduce Zero to Fit to customers I always talk about Coach Bob; he even has his own fan club! Bob coaches six sessions a week and Amanda does the two early morning ones. It is their goal and ours to help everyone get up and keep moving! Our third 10 week option of Zero to Fit starts in August and our coaches are ready to encourage and train. Our website also outlines our other training programs that are led by “super coach” Susan Paul. Although we think she is pretty super too, it was Runner’s World Magazine who gave Susan that title! I’m probably late to another meeting. When a store or an event is approaching a 40th anniversary, there is a lot to do. Besides Emma’s 30th birthday and Chris’ wedding this fall we are gearing up for the 40th OUC Orlando Half Marathon and 5k! Jon and I raised our kids at the store and at our events, so I know that lumping them in with our business anniversaries is really ok; Emma even helped me proof this article. 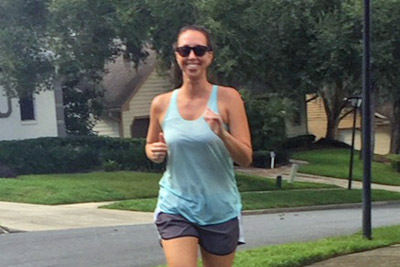 Before I rush off to that meeting, I plan to have some family time, get a short run in and remember how important it is to stay active and healthy, and now also be Orlando Strong!